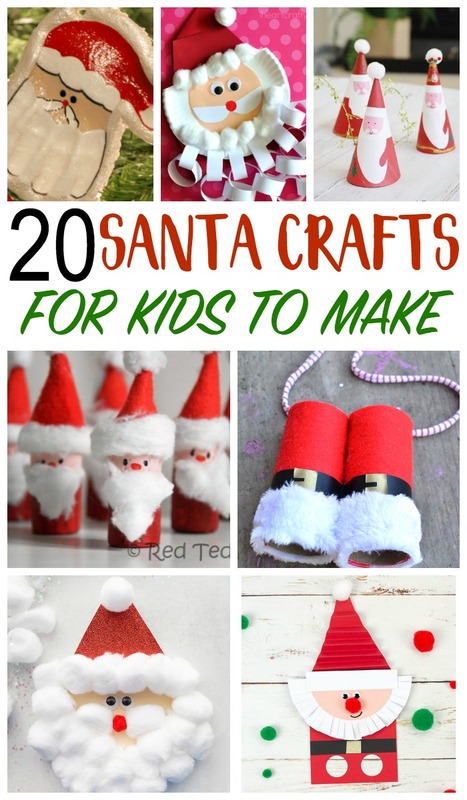 20 fun Santa Crafts for kids to make, and even play with! With all of the Christmas crafting with kids we’ve been up to, we just had to find some fun Sant Crafts for kids to make. Santa Claus, Kris Kringle, or St. Nicholas – whatever you call him, this jolly elf is so much fun to craft with kids. Santa Crafts are perfect for the younger children as they are still knee deep in the folklore and magic of Christmas. These Santa Crafts for kids are perfect for toddlers, preschoolers, and elementary children and would be a great activity to add to your Christmas holiday parties. Paper plate crafts are a standard in crafting with kids so we start our list of Santa Crafts for kids with this adorable paper plate Santa Claus. Print out this Santa template and make a fun Santa Craft that pops up the paper cup chimney. Save your corks to make these super cut Santa Cork ornaments – or use them to have a game of Santa bowling, how fun! Christmas handprint crafts are some of my absolute favorites and this hand print santa keepsake ornament is no exception. This is a wonderful santa craft to make and gift to parents or grandparents to keep for years. Use a doily and a triangle shape to make this paper Santa. Craft sticks are another staple in crafting with kids so if you have some on hand you can make this craft stick santa! Another way to use those craft sticks is by making this craft stick santa hat! Keep your eye on the sky watching for Santa and his reindeer with your homemade set of Santa Binoculars. Another craft stick idea is a roof top, complete with santa sliding down. This cotton ball santa is one of my favorite – so simple and so cute! This santa craft incorporates a fun art technique to print his beard. I love these Santa cones – a unique twist on how you would typically see Santa crafts designed. For this Santa Craft, his beard becomes the Christmas countdown. You can also make a puppet like this Santa Finger puppet with printable template. Or make a simple paper bag santa puppet. Turn your santa craft into an ornament with a popsicle stick santa. Your santa craft becomes a fine motor activity with this paper plate santa craft – once you’ve made his beard the kids can practice their cutting skills. For another fun handprint craft turn the kids hands into santa’s beard. Another cardboard tube idea to make another easy Santa ornament.